Simple object detection using keypoint matching. This module finds objects by matching keypoint descriptors between the current image and a set of training images. Here we use SURF keypoints and descriptors as provided by OpenCV. if enough matches are found between the current image and a given training image, and they are of good enough quality, compute the homography (geometric transformation) between keypoint locations in that training image and locations of the matching keypoints in the current image. If it is well conditioned (i.e., a 3D viewpoint change could well explain how the keypoints moved between the training and current images), declare that a match was found, and draw a green rectangle around the detected object. The algorithm comes by default with one training image, for the Priority Mail logo of the U.S. Postal Service. Search for "USPS priority mail" on the web and point JeVois to a picture of the logo on your screen to recognize it. See the screenshots of this module for examples of how that logo looks. Simply add images of the objects you want to detect in JEVOIS:/modules/JeVois/ObjectDetect/images/ on your JeVois microSD card. Those will be processed when the module starts. The names of recognized objects returned by this module are simply the file names of the pictures you have added in that directory. No additional training procedure is needed. Beware that the more images you add, the slower the algorithm will run, and the higher your chances of confusions among several of your objects. With JeVois v1.1 or later, you do not need to eject the microSD from JeVois, and you can instead add images live by exporting the microSD inside JeVois using the usbsd command. See MicroSD card organization and files (last section) for details. When you are done adding new images or deleting unwanted ones, properly eject the virtual USB flash drive, and JeVois will restart and load the new training data. With JeVois v1.2 and later you can train this algorithm live by telling JeVois to capture and save an image of an object, which can be used later to identify this object again. You should now see a gray rectangle. You can adjust the window size and aspect ratio using the win parameter. By default, the algorithm will train new objects that occupy half the width and height of the camera image. over a serial connection to JeVois, where somename is the name you want to give to this object. This will grab the current camera image, crop it using the gray rectangle, and save the crop as a new training image somename.png for immediate use. The algorithm will immediately re-train on all objects, including the new one. You should see the object being detected shortly after you send your save command. Note that we save the image as grayscale since this algorithm does not use color anyway. where somename is the object name without extension, and a .png extension will be added. The image will immediately be deleted and that object will not be recognized anymore. This module can send standardized serial messages as described in Standardized serial messages formatting. One message is issued on every video frame for the best detected object (highest score). This algorithm is quite slow. So, here, we alternate between computing keypoints and descriptors on one frame (or more, depending on how slow that gets), and doing the matching on the next frame. This module also provides an example of letting some computation happen even after we exit the process() function. Here, we keep detecting keypoints and computing descriptors even outside process(). The itsKPfut future is our handle to that thread, and we also use it to alternate between detection and matching on alternating frames. Definition at line 169 of file ObjectDetect.C. Definition at line 176 of file ObjectDetect.C. Definition at line 182 of file ObjectDetect.C. Definition at line 187 of file ObjectDetect.C. Receive a string from a serial port which contains a user command. Definition at line 318 of file ObjectDetect.C. References jevois::Component::absolutePath(), jevois::Component::removeSubComponent(), jevois::split(), and jevois::system(). Processing function with no USB output. Definition at line 197 of file ObjectDetect.C. 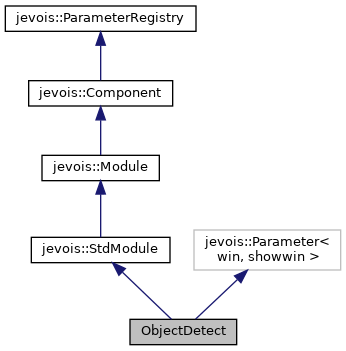 References jevois::StdModule::sendSerialContour2D(), jevois::Timer::start(), and jevois::Timer::stop(). Processing function with USB output. Definition at line 220 of file ObjectDetect.C. References jevois::rawimage::convertToCvGray(), jevois::rawimage::drawFilledRect(), jevois::rawimage::drawLine(), jevois::rawimage::drawRect(), jevois::RawImage::fmt, jevois::RawImage::height, jevois::rawimage::paste(), jevois::RawImage::require(), jevois::StdModule::sendSerialContour2D(), jevois::Timer::start(), jevois::Timer::stop(), to_string(), jevois::RawImage::width, and jevois::rawimage::writeText(). Human-readable description of this Module's supported custom commands. Definition at line 374 of file ObjectDetect.C.